The school year is approaching faster than you’d probably prefer, but it’s important to start getting prepared well ahead of time. A very popular option for planning is a bullet journal. 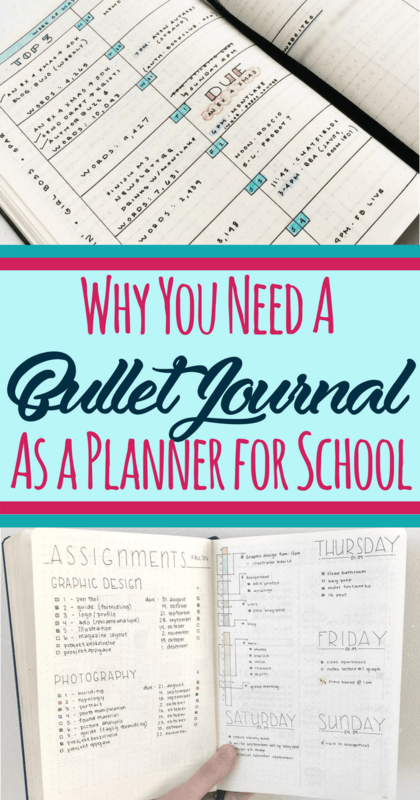 Maybe you’re considering trying a bullet journal for school next year! Bullet journals are creative planner options for teens and adults alike. They are a terrific and flexible planning tool that proves beneficial for the thousands of individuals who use them regularly. But for students who have trouble managing their time, maybe you’re wondering if using one is a worthwhile option to consider as a planner? 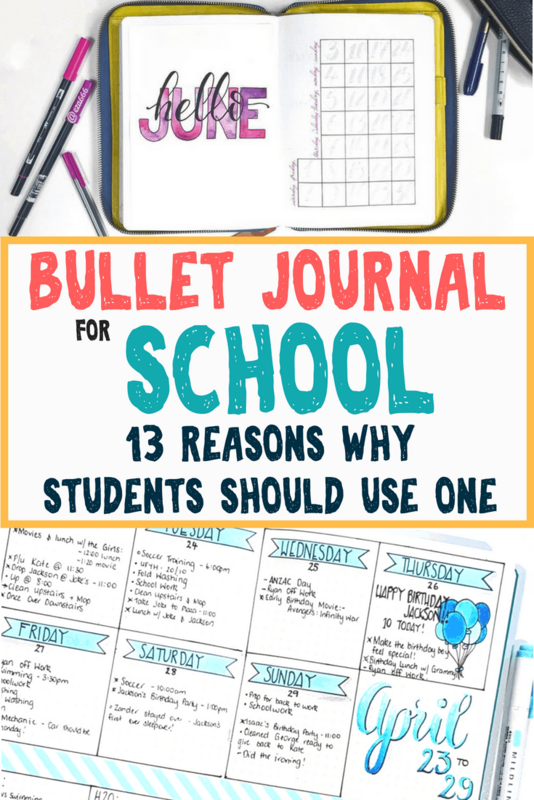 This post will explore whether students should have a bullet journal for school. 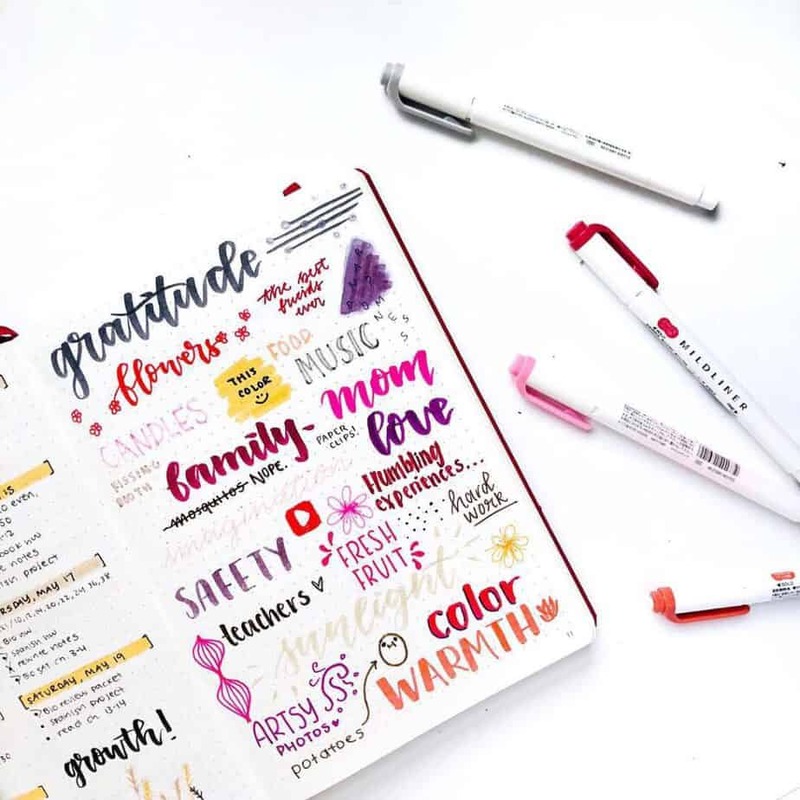 They aren’t the best choice for every student, but you will leave this article with confidence knowing whether a bullet journal is right for you. I’m going to split this question up into two parts: One for parents, and one for students. If you’re a student, feel free to scroll down a little further to see why you should use a bullet journal for school. While this article is primarily aimed at students, there are likely parents of middle school and high school students trying to determine whether this is a viable option for their child. Either their student in school wants to start a bullet journal, or the parent believes it may serve as a good option for their disorganized student. Parents can’t help but wonder if it’s a worthwhile option to help their kids improve their time management or just a waste of time and resources. For many students in high school or college, time management is not a primary strength. In reality, most students don’t receive much instruction nor guidance on learning good time management skills in the first place. At best, students receive planners and are told to ‘write down their assignments’. It’s extraordinarily unfortunate that our society teaches that time management is akin to jotting down assignment due dates and upcoming tests. There is WAY more to good time management. 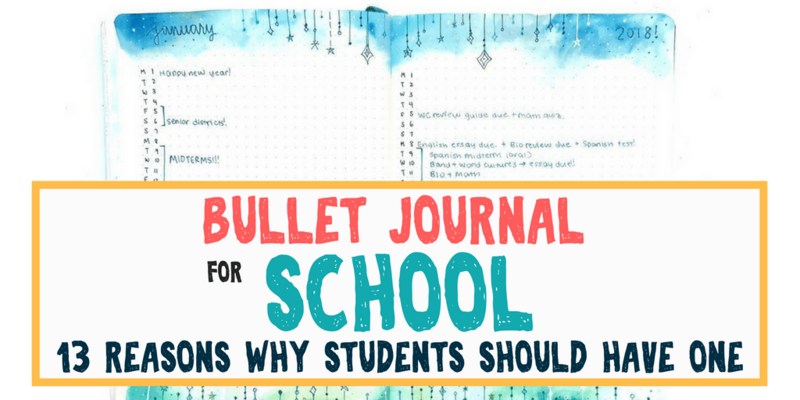 This article will hopefully help you determine whether a bullet journal could be an option to present to your student. Time management is a necessary life skill. Some of you already know that, and you are itching at the creativity opportunities a bullet journal can bring. But for many more, time management is BORING. You’re sick of feeling nagged by teachers and parents alike. Yet you can’t deny that to be successful in life, you have to get your act together enough. The real world still has deadlines and expectations, and school is your opportunity to practice. I can say from experience that the longer you wait, the harder it gets. 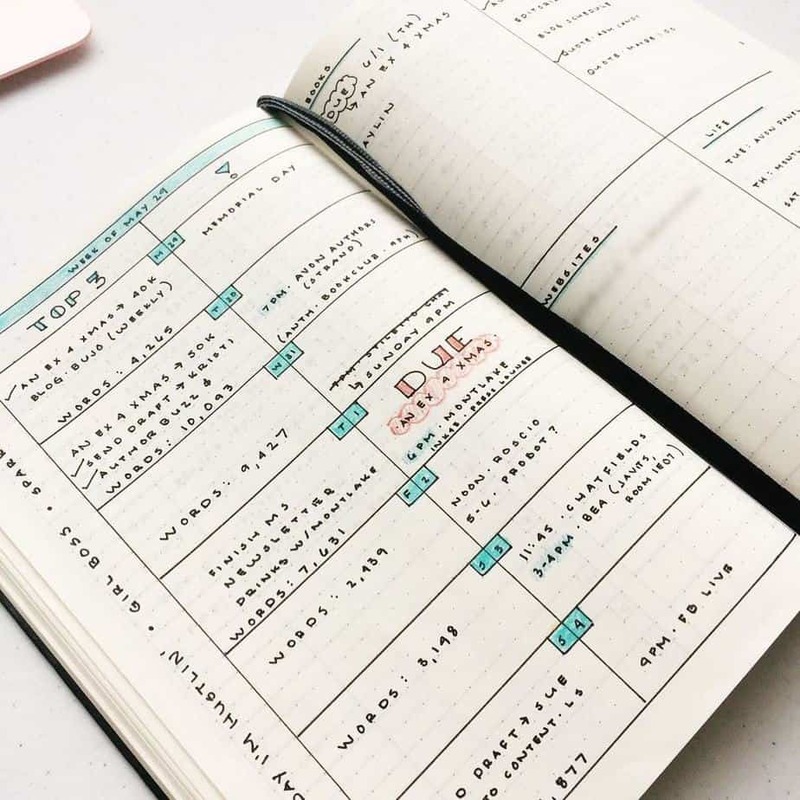 I also say confidently that if I knew about bullet journals when I was in high school or college, I wholeheartedly believe that it would have been a significant game changer in my own time management. Nothing better than a huge, wide open space for you to set up everything you need to succeed for the next semester of school. With a general planner, you’re often limited into writing down project due dates, schedules, and other date-specific information. 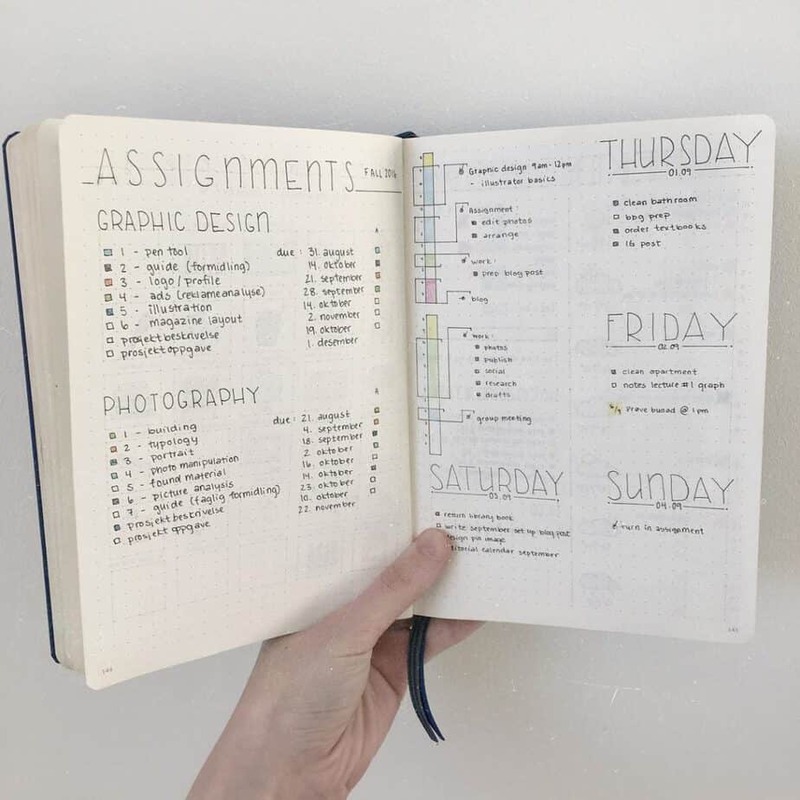 But with a bullet journal, you’re able to set up any type of school spread you may need that will help you get organized and prepared ahead of time. Have you figured what you want to accomplish for your school year? No? Setting your goals before the school year is an excellent way to set an intention for yourself. That way when the going gets tough, you have something to hold onto during the challenging times. 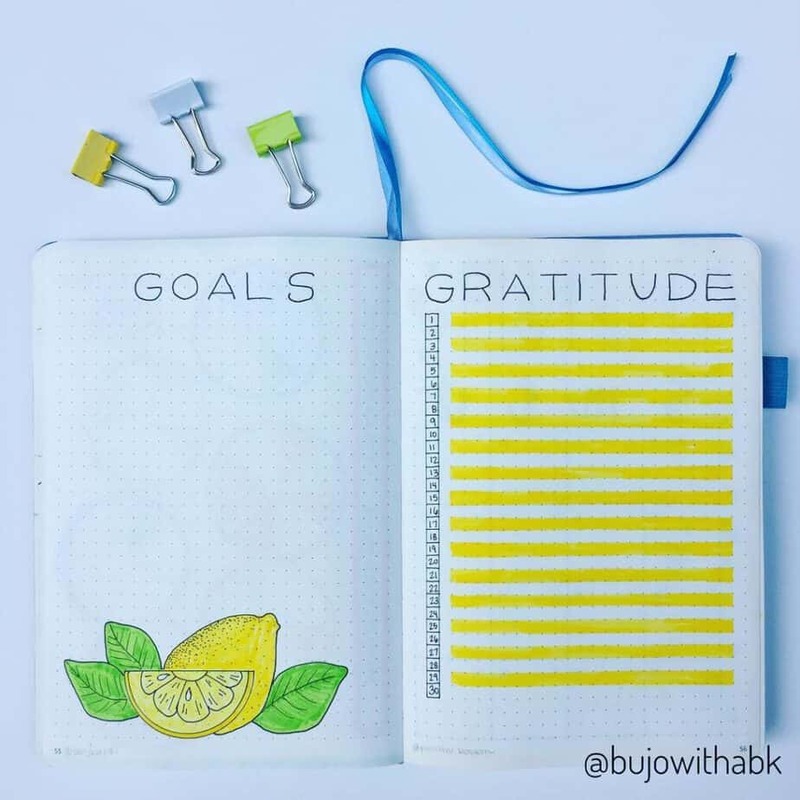 And your bullet journal is a perfect place for a goal log! The best part about using a bullet journal for school is that they are fun to use year round! School is just one excellent place to take full advantage of them. If you’re setting yours up before school starts, that’s even better. You have time to set up trackers, monthly spreads, weekly layouts, and other relevant school collection pages before you get busy. Not to mention, it’s a great way to organize all of the things you have to do before school starts. Make a list of school supplies you need, and check them off as you go. Need to go shopping? Renew your driver’s license? Write it down in your bullet journal! I don’t know about you, but when I was a student, I had a very challenging time managing 6-8 separate binders for each course I took. I felt like I couldn’t keep track of any of my assignments very well. 5. Creativity can be a great motivator. Many bullet journal fans love stationery, and you can use your stationery for school, too! Who says you can’t write down your assignments with a glittery pen. Not to mention, if you get bored during lectures, doodling in your bullet journal is creative and can help you focus as well. Just, make sure to get a cool carrying case for your pens. Unfortunately, people who don’t get the joys of fun stationery supplies will not think twice about taking your favorite pen when they ask to loan it. 6. Your classmates and teachers will be very impressed. Really, you should keep a bullet journal for yourself. However, your creativity and dedication to time management will help you stand out in a good way. Teachers love proactive students- and a bullet journal is about as proactive as you can get! You’re pretty much creating the structure for yourself! 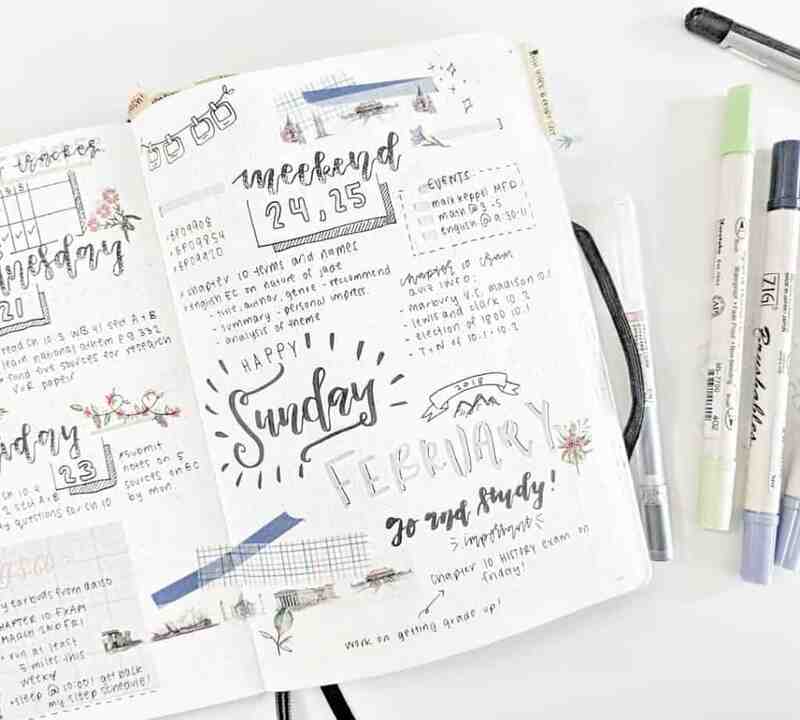 For students heading into college, a bullet journal can present some creative advantages for college admission interviews. It shows students take initiative with their time management and organization. Colleges always admire students who show creativity and put matters into their own hands. 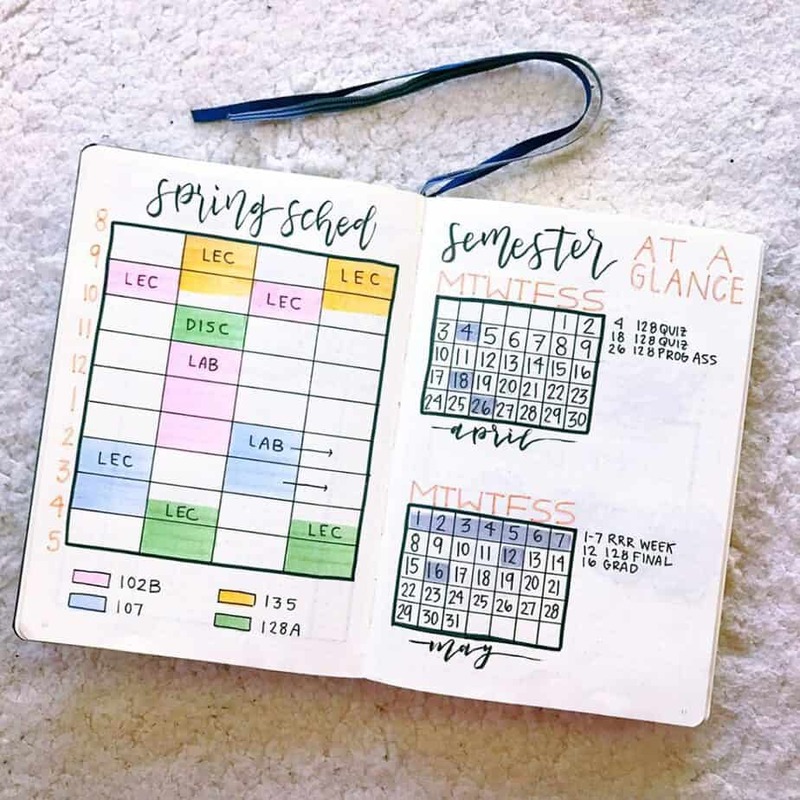 Not to mention, since college is the time where students start to take an initiative toward their own education, a bullet journal can serve as proof as a student is beginning to do this themselves. If you’re trying to graduate high school with a special honors program, or you’re in college, it can be tricky to remember all of the little requirements that are necessary to finish. 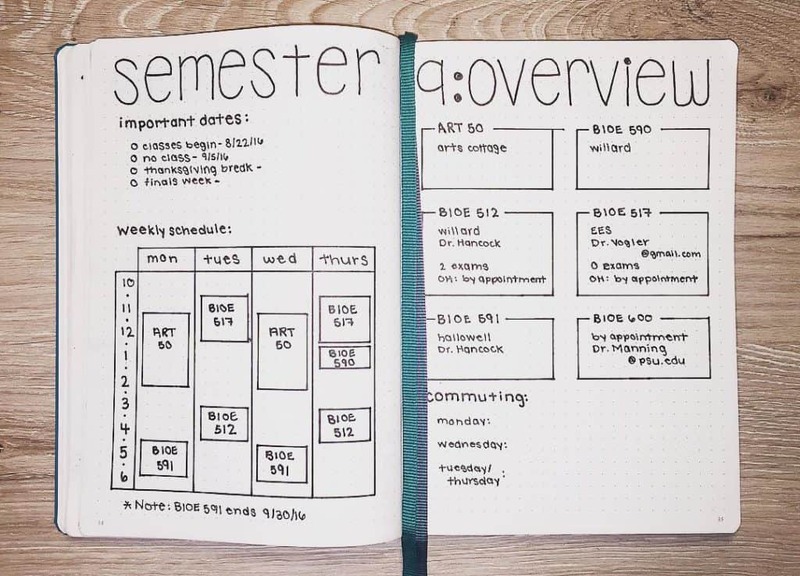 Well, why not create a page in your bullet journal to help you remember everything assignment, class, and project you need to finish in order to complete. Some mornings are rough, let’s face it. You’re lucky you made it out of the house in regular clothes! When you get to school and see you forgot your notebooks for class, it can be a cause for instant panic! But if you have your bullet journal… it’s always a great place to write your class notes just in case. School isn’t just academics. You spend a lot of your life in school. You make amazing friends, you go through challenging times, deal with heartbreak, and create memorize that will last a lifetime. Your bullet journal is a quick and easy place for you to remember all of that. 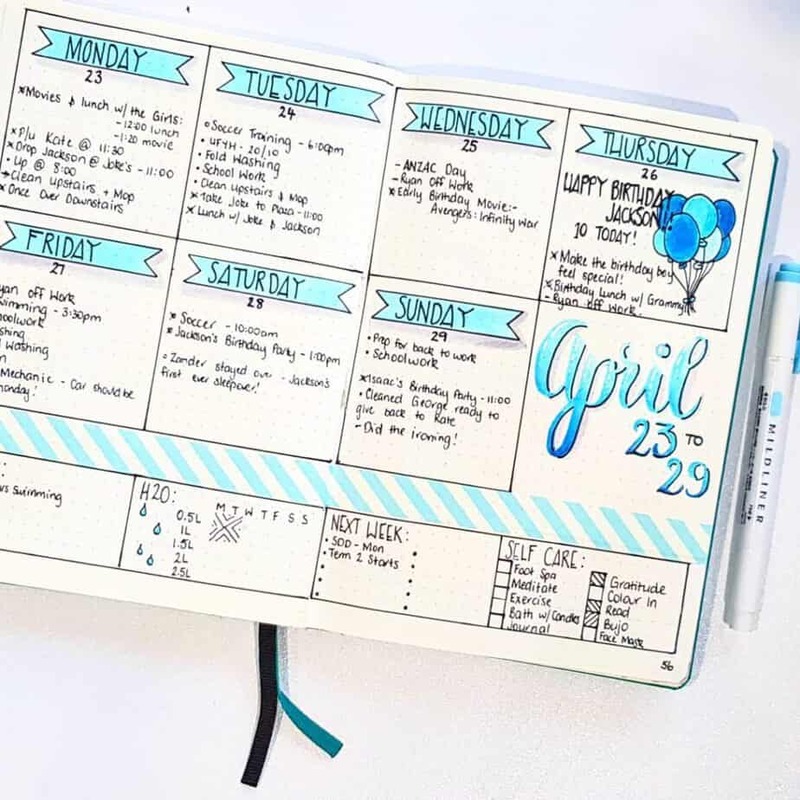 Make sure to leave spaces open in your weekly and monthly layouts to record fun memories. Or, if you’d rather, dedicate a special collection to the memories you make while you’re in school! This one may be more relevant for the beginning of the semester, but sometimes it takes a few weeks to get a new schedule down. So not only do you have a place where you can easily pull out to verify your class locations and time, but this also gives you the opportunity to review this information before school starts back up again. If you’re in college, here’s a fun tip! While you’re setting up this spread, make sure to grab a campus map and flesh out the best routes to get to your class, and maybe some great study locations nearby if you have time in between classes. Add this information on the page next to your class schedule for added benefit. Throughout the school year, chances are you’ll have meetings with teachers or groups that you’re involved in. Keeping a ‘notes’ section in the back is a great way for you to write down important information from those meetings. 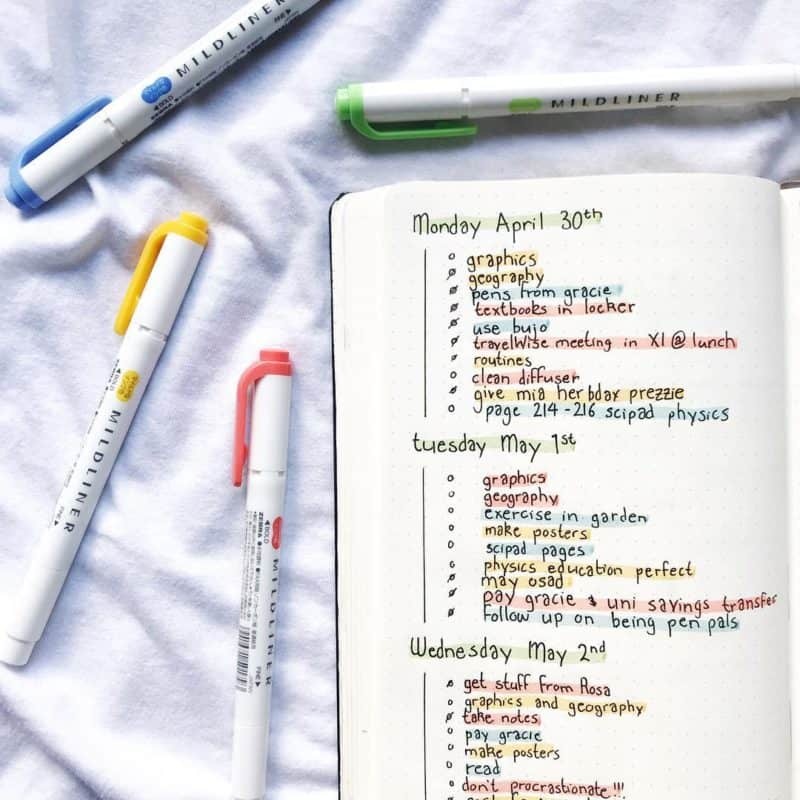 Having this space available in your bullet journal not only makes you look super organized (see point 6), but you’ll have easy access to this information wherever you go. As a student, you have a lot on your plate. It is so easy to start eating too much junk food, staying up too late, and oversleeping in the mornings when you’re stressed out. One of the biggest challenges of the traditional school planner is that there is literally only one layout option. Typically you’re forced to use a specific size, as well. 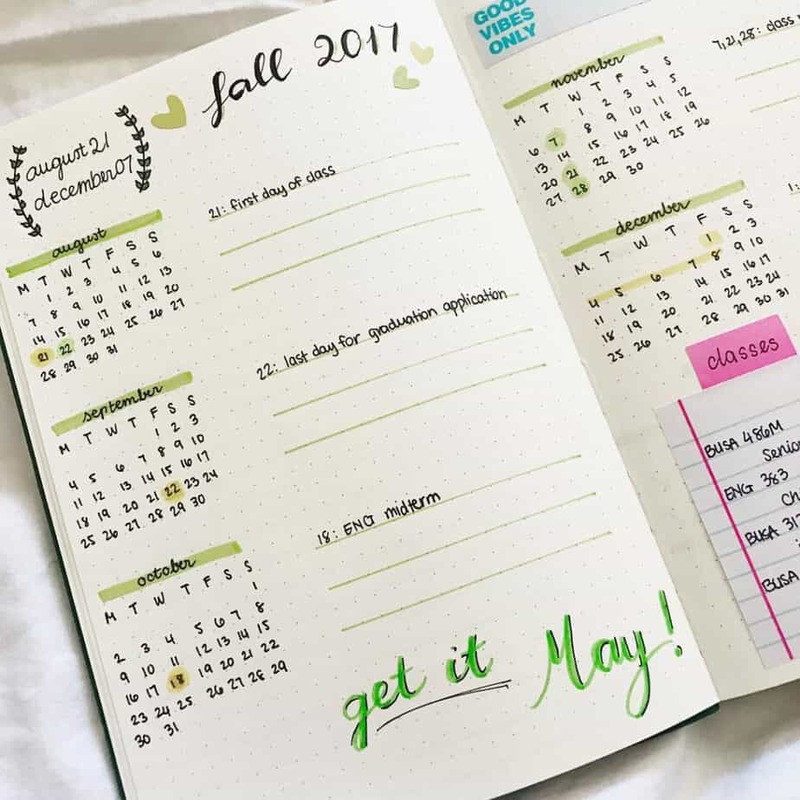 While there are plenty of students who thrive with this general planner option, a lot more students find that this concept isn’t the best to suit their time management needs. A bullet journal allows the student the flexibility to create whatever they need to succeed. My favorite reason why students should keep a bullet journal for school is that they can create it specifically to meet their needs. As I mentioned, there is no right way to do this or no specific method that is better. Students who prefer minimalistic structures can keep it simple with a black and white format. Students who love art, color and create fun spreads that work for them that follow no particular structure whatsoever. Not to mention, students who are short on time can take advantage of printables and stationery that helps to create the structure they desire in a quarter of the time it takes them to create it all themselves. Should you have a Bullet Journal for school? 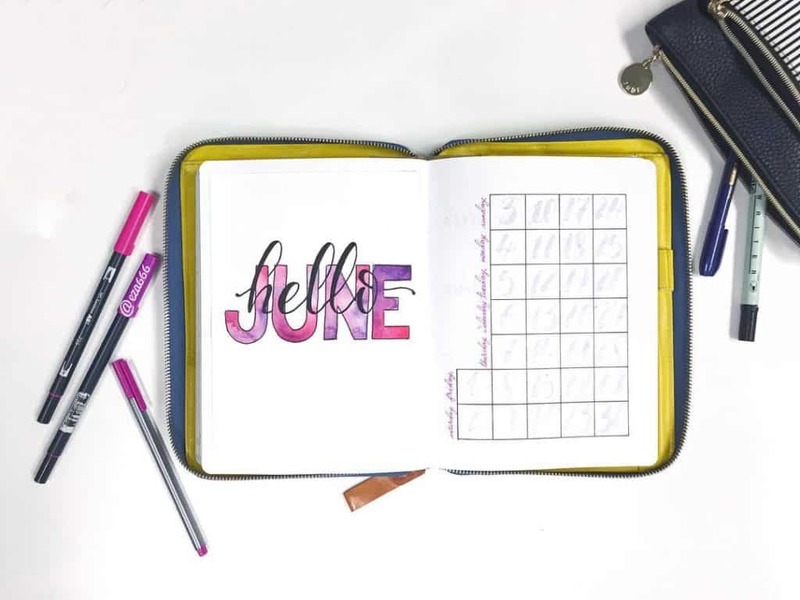 If you’re a parent, you may have reservations about the amount of time and energy it takes to put into setting up and maintaining a bullet journal. That, or you’re hoping this may be the key to improving your child’s time management. If you’re a student, you may feel skeptical about another option that may not work. As I said at the beginning, bullet journals aren’t for everybody. You shouldn’t feel pressured to use one if you don’t feel like it’s going to be a good fit. 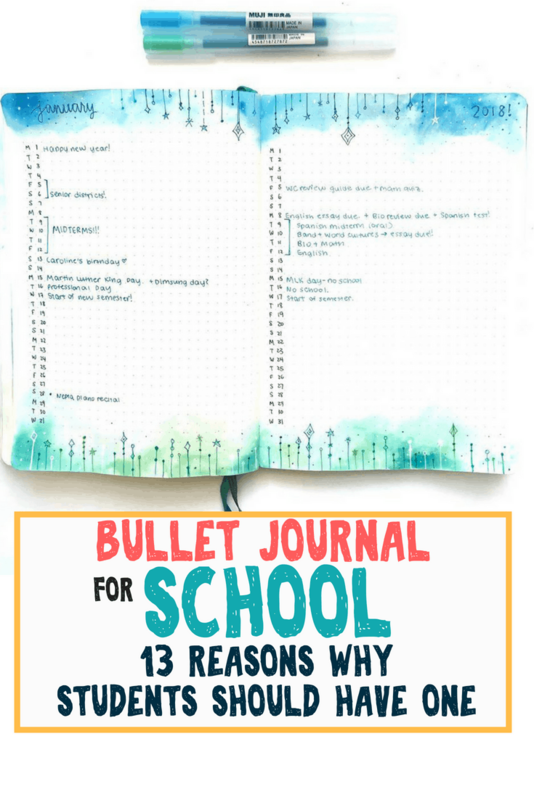 Have you used a bullet journal for school? Feel free to share your experience with using one in the comments! Did this article convince you to use a bullet journal for school? Convince others by sharing it on Pinterest! Any suggestions on getting started using a bullet journal as an adult for home, work and activities? How would you start using a bullet journal as a mom with ADD?